A short activation en route to collect furniture. Travelling past Mt Ainslie so it seemed a pity to waste an opportunity especially with so many SOTA operations under way. Chasing from a summit is better than chasing from home. Planned to use 40m only but tried a 2m contact with Ian VK1DI. That resulted in a call from Phil VK2HPN who was in Queanbeyan at the time (about 10 km away). 40m activity was good. Log: VK3PF, VK3YY, VK3ZPF, VK3DET, VK3FPSR, VK3JM, VK3UP, VK1DI/2, VK2NNN, VK3UBY, VK2FGJW, VK2MEV/p, VK3BYD. I got on the air just after 6pm in time to make a s2s contact with Matt 1ma who had started to descend his last summit for the day. He kindly offered to turn around and go back up so we could have the contact. Then I looked around 20m for signals to get an idea of what the band was doing. Some good sigs from EU so I looked at 14062 and made a cq call. Nil reply so I tried responding to a strong EA on 030. He barely copied me and did not give me an RST report and did not respond to requests for same. Lot of qrm. A Few other qsos followed on 030/1 and 062. About 6 or 7 contacts but quite low signal reports. I will configure the vertical differently next time. I had wire for four radials but only put two out because I was operating from a site with a lot of other people walking up and around me. I didn’t want to create a trip hazard for them. One of them said she had seen radio people up there before. After walking back down chatting to Matt on his way back into Canberra from the northwest area he had been activating, I went to the radio club meeting where Dimitris vk1sv gave a presentation on the ANU ion accelerator. I have added a SOTA page to the VKFAQ.AMPR.ORG website, covering the basics and the details of SOTA with some specific details for Australia. I recently purchased a programming cable for use with the FT817. Plenty are advertised on eBay. The USB plug is larger than a plain USB plug as usual for one of these USB-serial adaptors, as it contains the electronics to convert from USB to plain serial required by the radio. The software on the cd included a driver for the USB adaptor and several other programs including a 2012 version of HRDeluxe, a digital modes utility and a few other programs. A specific program for the radio programming was not included. The cd also included some “readme.txt” files and advice on how to work out which COM port was allocated to the adaptor, as most older software including HRD apparently is designed for COM ports rather than USB. I installed the driver and it worked ok, revealing that COM9 had been allocated to the USB adaptor. I opened the Windows control panel and found the details of the USB adaptor. In the tab revealing the com port allocated I double clicked (or right clicked?) the COM9 and was offered the option of changing it to another unallocated port. I chose COM1. 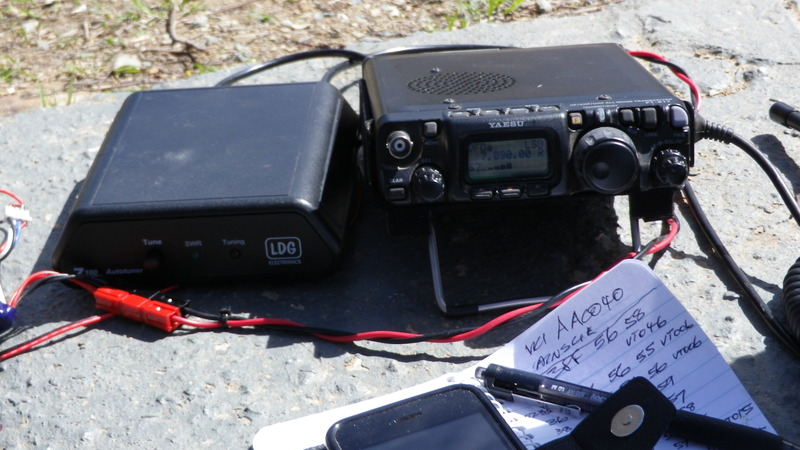 This still did not allow a connection to the FT817 to work. To see whether the USB hub needed to be restarted to get the new COM port to work, I unplugged and reinserted the USB adaptor cable. Checking in control panel > device manager showed that the USB adaptor was now indicating COM1. Launching the 817-mem Yaesu programming tool again, it now found the 817 on COM1 and I could then read the memory contents of the radio, save as csv, modify the csv with notepad++, then reload the csv and send it to the radio. I set memory freqs for cw and Ssb frequencies on the hf bands and some net frequencies for VHF bands. Programming the 817 direct using the front panel controls is quite feasible but having the memory channels saved externally is convenient. Also being able to clone and edit in an ordinary text editor is handy. Seeing the frequency and mode settings on a screen is better than having to scroll around them on the 817. VK2 and VK4 have joined SOTA, a world wide award programme originating in the UK and now active in many European countries, the USA, Canada, Korea and some states of Australia. I took on the role of association manager for vk2, aka New South Wales, initially to coordinate the surveying of mountains to identify the complying summits for the SOTA award. Enjoying portable operation myself, I thought having NSW in the SOTA map would provide me with additional incentives to climb more local and distant mountains, enjoy the Australian bush land, use amateur radio in a slightly different way and along the way improve my fitness. All NSW regions have been included in the initial registration. Amendments can be made annually. The association manager for vk4 (Queensland) is Dave Clodd VK4OZY. Due to the size of Queensland it was not possible for one or two surveyors to cover the whole state. Queensland’s most populous area in the south east and along the coastline north from Brisbane have been listed and other regions will be added according to demand in annual updates.